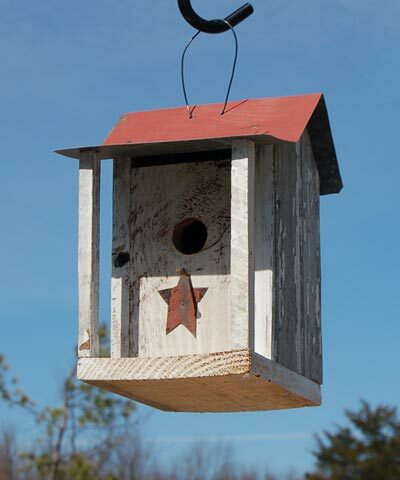 Offer an avian family a rustic summer shelter by placing this Bird In Hand Beavertown Bird Shack Bird House in your backyard. The familiar shape of this piece mimics one room pioneer homes traditionally found in Appalachia, thanks to its extended metal roof and supporting columns. Crafted from reclaimed wood, the distressed body lends an antique look to your yard in moments, enhanced by the weathered white and gray finish. The square body provides birds plenty of nesting area, while a 1.25" diameter entry makes it simple for them to access the unit. A nail extends beneath this entrance, offering birds a perching spot, and a metal star beneath it adds a whimsical hint. Matching, aged metal with a red finish forms the generous roof, protecting the nest from the elements, and a gap beneath it keeps the shelter ventilated. The back panel lifts upward for nest checks and maintenance, and a plastic coated cable through the roof makes it simple to hang this abode. For a different look, add a mounting bracket (not included) to the base of the item to display it on a pole or post. The reclaimed wood construction forms a one-of-a-kind home, and diminishes landfill waste for an environmentally sound piece. Bring a bit of mountain style to your bird garden with this Beavertown Bird Shack Bird House. Made in the USA.